Goodreads: Thirty-somethings Brittany and Kyle have only been together four months, but she knows he's the one. Hosting Thanksgiving dinner at their Toronto apartment, with the food catered since neither of them are good cooks, will be a perfect way for their relatives to meet and become one big happy family. Marilyn and Virginia have hated each other for nearly sixty years, since Virginia got herself pregnant by Marilyn's boyfriend then married him. Both too stubborn to leave their small Ontario town and let the other one win, their feud rages on whenever they encounter each other and particularly at the town's annual pie-making contest, which only they enter because nobody else dares to get caught in their crossfire. When the relatives arrive on Thanksgiving, the truth comes out: Marilyn is Brittany's grandmother, and Virginia is Kyle's. And for once Marilyn and Virginia agree on something: no relation of that horrible woman is good enough for my grandchild. Desperate to stop the unending guilt trips but not willing to cut the grandmothers they love from their lives, Brittany and Kyle accept an invitation to the ultimate battle: the pie-making contest. If they win, the grandmothers agree to accept their relationship, or at least pretend to, and be civil to each other. Lose? The grandmothers will never again be in the same room, so Brittany and Kyle will spend every holiday separately while listening to their grandmothers criticize their partners. 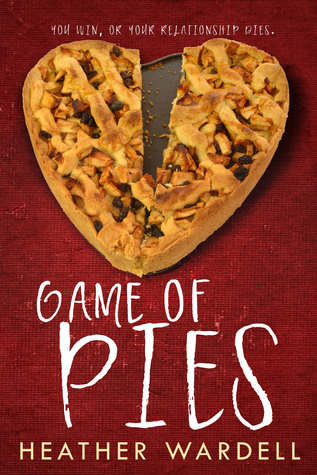 With only two months to learn to bake a better pie than women who've been at it for decades, can Brittany and Kyle win "The Game of Pies" and save their relationship? Kritters Thoughts: Brittany and Kyle have been dating for a short amount of time, but they have decided to host a meal for their families just after Thanksgiving. Both of them hold in high regard their grandmothers, so when the family dinner begins and long held grudges are revealed, Brittany and Kyle have to decide relationship or family. This was one of those short and sweet romantic comedy books. At just over 200 pages, this was a bit more than a novella and a great length for a perfectly sweet romantic story. Now it wasn't too too sweet, they definitely had ups and downs and some hard decisions to make, so I liked that it was a little close to reality. I have become a fan of Heather Wardell and her books are great escapes from some of the hard and intense reading that is happening. I like to curl up with her books on a quiet afternoon and just escape into the story.